Will Malibu A/C Line interchange with the 77 Monte ? I can't really say with 100% authority...but, if it looks like this one I removed from a '77 Monte...then, yes. 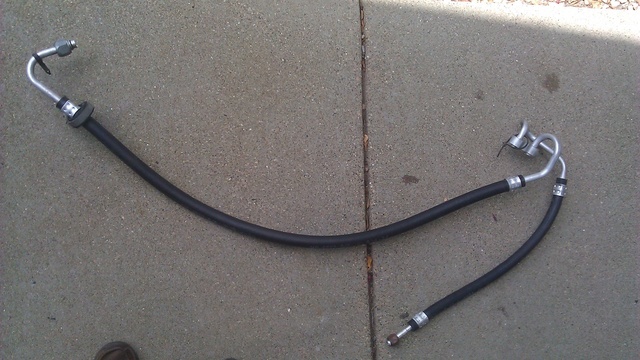 Can't seem to find part numbers for this hose...just the smaller diameter hose that runs from Evaporator to Condensor. As was GM's practice, it's almost a certainty that they would fit across same year models. Let me know if I can be of further help. I still have it...but, wanted to keep it as a spare for my Monte. It's in mint shape with all GM lettering/numbers on it and rubber part not showing signs of dryness/surface age cracks you normally see. Let me think about it. Perhaps I could find another one for him if he isn't in a big hurry? He is Kinda in one, But I was going to sell him Mine if is it the same Length ?? Can't he take a measurement and compare with yours? I'd be really surprised if they were different lengths. As far as I know, all components for both makes are in the same relative position on the firewall, block and radiator support.